A car crash harnesses elements of eroticism, aggression, desire, speed, drama, kinaesthetic factors, the stylizing of motion, consumer goods, status — all these in one event. I myself see the car crash as a tremendous sexual event really: a liberation of human and machine libido (if there is such a thing). This is a song with quite a bit of history, so let’s start at the beginning. Originating in Russell’s previous groups The Nightmares and Rachael Tension and the Disruptives, it was reworked by Jarvis, who added the bizarre lyrics about “someone who gets a sexual thrill out of being run over by the woman he’s in love with.” After featuring in The Fruits of Passion, it was recorded in each of the band’s three 1984 recording sessions, clearly intended as a first single. A music video was made with the help of “someone from Sheffield Art College,” but proved to be a botch job – a last-minute re-edit to make the tempo of the song match the style of the film apparently failed to save it. One of the few screenings this video ever got was as a presentation to Fire Records. The label signed them soon after, but were unconvinced by the band’s pleas to release ‘Maureen’ as a single, and put out Little Girl (With Blue Eyes) instead. While remaining an occasional part of the band’s set, the song’s time had been and gone, and a professional recording was never attempted. Ignore all the nonsense, though, and check out what a song it is – like a breath of fresh unchained air after the professionalism and self-control of ‘It’. We start with Magnus’s irresistible lolloping drum-beat, then there’s a massive release of pent-up energy as the rest of the group dive into a garage-rock / psychobilly thrash. If it sounds like anything it’s one of The Cramps’ fast ones, only with a growling bass line undercutting the treble. Magnus and Manners are the stars here, driving the song forward with palpable energy and aggression. Without their sudden shifts in tempo the drama in the track would quickly dissipate. The strangest thing about ‘Maureen’ should be the lyrics, and while they are both odd and fairly well-written, they fail to shock, or worse they try to shock, but fail. It’s unclear whether Jarvis had read J.G. Ballard’s ‘Crash’, but it’s clear that this he’s not a genuine sufferer of symphorophilia. 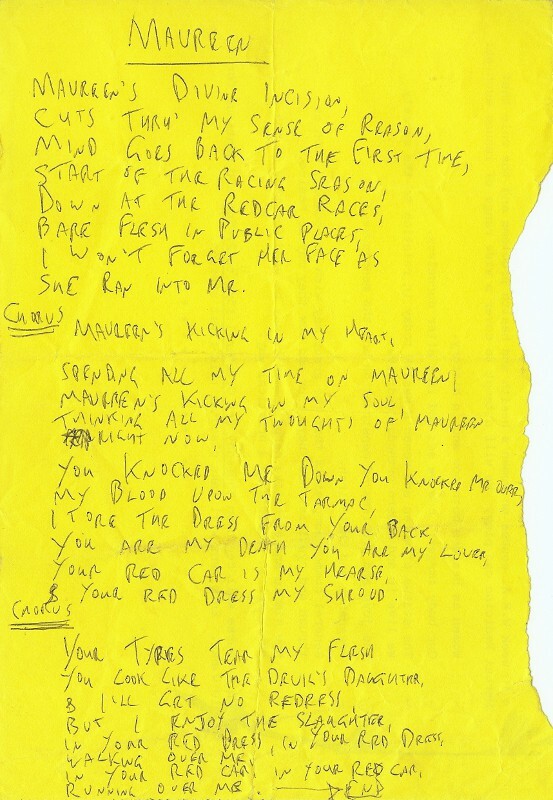 Instead of genuinely perverse images we have faux-poetic allusions about “your red car is a hearse / and your red dress my shroud”. Hearses aren’t red, neither, generally, are shrouds. The only time we reach beyond sixth-form poetry is the third verse, with tyres shredding skin and a recurring motif of a red dress, a red car, and of course blood. But the words are not important here, nervous energy is all we need. * For the sake of sanity I’m basing this on my favourite version – from the “Sudan Gerri” demo of November ’84 – and there’s a good case to be made for other takes, especially the notorious “Bad Maureen” which gave its name to the band’s first session. One day Jarvis arrived at work to find that a consignment of crabs had been delivered early and left in stagnant water overnight. 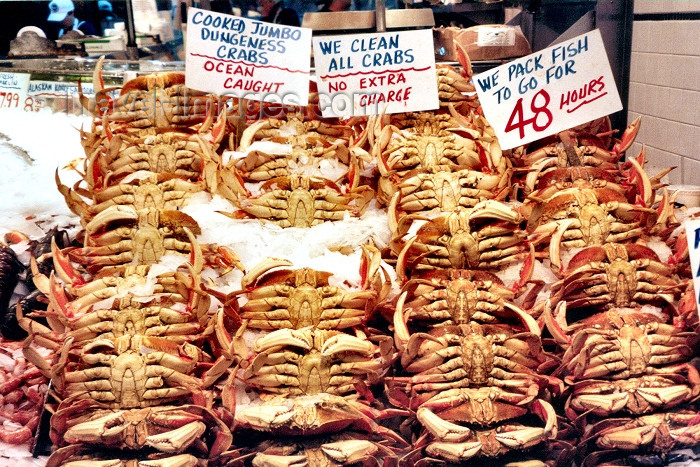 Naturally they had started to rot, but despite the smell being noticably bad, the crabs still went on sale to the public, and a few had already been sold before a health inspector arrived to condem them all. Instead of selling just a few, though, the crowd seem to be attracted by the crabs’ pungent odour, and though they complain, they gather round and buy the things, driven by some terrible mob instinct, which drives the fishmongers to sell them the poisonous crustaceans. Yes, it’s not the most subtle or serious of songs, but at least it’s quite funny, and had a bouncy ska-punk tune which still sounds ok today, as far as I can tell from the muffled scrap of a live recording which was broadcast as part of Radio 1’s “The Pulp Story” in 1997. It’s impossible to get much of an impression from this brief clip, but as it stands this is the earliest extant bit of Pulp, and someone out there has a full recording.